In December 2008, the U.S. Fish and Wildlife Service (FWS) proposed designating approximately 5,900 square miles of nearshore, marine waters as critical habitat for this threatened population of sea otters. An economic analysis indicated that designation of critical habitat would not result in a large economic impact to residents of southwest Alaska. After consideration of the economic analysis, public comments submitted in writing and at one public hearing, the final designation is essentially unchanged from what Service originally proposed. Critical habitat designation identifies geographic areas that contain the specific habitat elements essential for the conservation of the species. The designation has no influence on private land unless proposed activities there are federally permitted or funded. The physical and biological features believed to be essential to sea otter conservation are those that provide cover and shelter from marine predators, especially killer whales. These areas primarily consist of shallow waters (less than 20 meters deep) and nearshore waters (within 100 meters of the mean tide line). Federal agencies that undertake, fund, or permit activities that may affect sea otters are required to consult with the Service to ensure such actions do not pose a risk to the population, or adversely modify or destroy designated critical habitat. The designation of critical habitat does not affect land ownership or establish a refuge, wilderness, reserve, preserve, or other conservation area. It does not allow government or public access to private lands or limit public access to public or private lands and waters. The Service does not anticipate that designation of critical habitat for the southwest Alaska DPS of the northern sea otter will result in any closure of commercial fishing in southwest Alaska. Sea otters eat primarily benthic (bottom-dwelling) invertebrates; for example, in the Aleutians their diet consists mostly of sea urchins, crabs, octopus, and some bottom fishes. Because of their dependence on benthic prey items, sea otters spend the vast majority of their time in shallow water, typically close to the shore, and this preference is reflected in those areas proposed for critical habitat designation. The Service recently worked with the Alaska Department of Fish and Game to analyze that agency’s commercial fishing database. The results indicated that the species which otters most often prey upon are of little or no commercial interest. In addition, the areas proposed as critical habitat, as described above, are not areas where significant commercial fishing occurs. 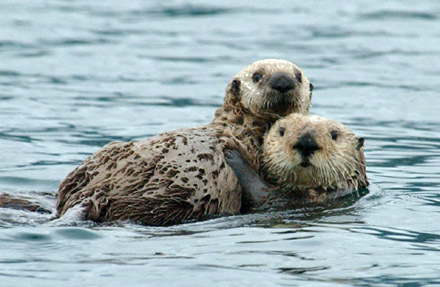 Sea otters are members of the weasel family (Mustelidae) and live in the nearshore waters along the North Pacific Ocean. They are the smallest marine mammals, and are most closely related to river otters. Historically, sea otters occurred in near shore waters around the North Pacific rim from Hokkaido, Japan through the marine coastal areas of the Russian Far East and the Pacific coastal areas in the United States as far south as Baja California. The world-wide sea otter population was reduced to just a few hundred animals between 1742 and 1911, due to commercial harvest by the Russian and Russian/American fur trades. Three populations of sea otters exist in Alaska today, of which only the southwest Alaska DPS is listed as threatened. The statewide population is believed to number around 70,000 animals. Sea otters are the largest member of the weasel family and the smallest marine mammal. Ninety percent of the world’s sea otters live in coastal Alaska. The Marine Mammal Protection Act protects sea otters. It prohibits commercial harvest of sea otters, and allows Alaska natives to hunt sea otters for subsistence and creation of handicrafts. Historically, sea otter populations made a dramatic comeback after near extinction due to overhunting, and later survived the Exxon Valdez oil spill. The population there has been listed as threatened under the Endangered Species Act. See the southwest Alaska sea otter recovery team page for more details. This description of sea otters is provided by FWS. develop marine mammal co-management structures with Federal and State agencies. Marine Mammals Management administers such agreements with The Alaska Sea Otter and Steller Sea Lion Commission. Projects have included boat-based trend surveys of sea otter populations, gathering traditional knowledge about sea otters in coastal Alaska villages, and developing regional and local sea otter management plans. These projects involve local Alaska Natives who subsistence hunt and use sea otters to participate in conserving sea otter populations for future generations. Learn more about cooperative agreement under Section 119 of the Marine Mammal Act.